The elephant is the world's largest and heaviest land animal. These huge beasts, some getting as heavy as 15,000 pounds, can be found throughout sub-Saharan Africa and southern Asia. Their distinctive trunks are used for breathing, lifting and squirting water, as well as grasping objects. The elephant's tusks can be utilized as weapons and as tools for moving objects and digging. 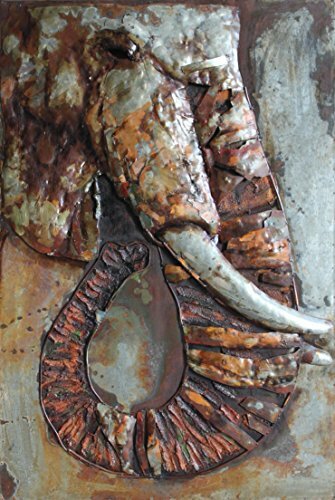 Primo's powerful mixed media wall sculpture of the elephant brings this animal home in a most striking fashion. No African artistic motif is complete without the elephant.